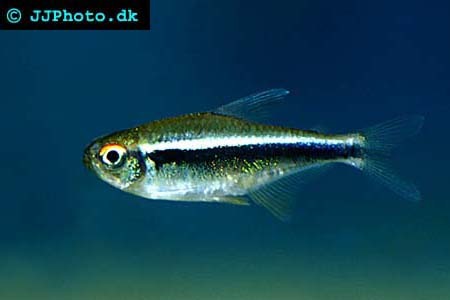 Company: Hyphessobrycon herbertaxelrodi (Black Neon Tetra) are suitable for community aquariums. Aquarium setup: Hyphessobrycon herbertaxelrodi (Black Neon Tetra) prefers a clean well planted aquarium. They can be kept in much the same way as the regular neon tetra. Make sure that you keep your water clean. Hyphessobrycon herbertaxelrodi (Black Neon Tetra) should not be kept in groups of less then 10 specimens. Feeding: Hyphessobrycon herbertaxelrodi (Black Neon Tetra) accepts most foods including flake food. Breeding: Hyphessobrycon herbertaxelrodi (Black Neon Tetra) can be sexed due to the fact that males are slimmer then females. They are easy to breed and the parents should be removed from the breeding aquarium once the egg laying is completed. They are egg scatterers.